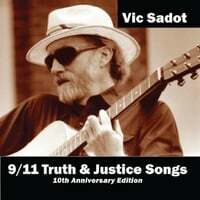 Licensed for use by Vic Sadot on “9/11 Truth & Justice Songs” released on 9/11/11. This is a lyrical update Bobby Darin’s 1969 anthem to struggle! Come and sing a simple song of Freedom! Sing it like you’ve never sung before! Let it fill the air! Tell the people everywhere! We the People! We don’t want your war! Hey there Mister Rich Man! Can you hear me? I don’t want your mansion or your shame! I just want to house and feed my family! Don’t want your wars of terror in my name! How many have you armed and enlisted? We’ve seen the way you demonize with lies! You’re the masters of the media we’ve resisted! Full of lies to divide and destabilize! Come on people! Don’t buy propaganda! Don’t buy the corporate media’s dirty lies! It’s a bloody game by those who have no shame! To feed their greed and power, Freedom dies! Only by making Justice can Peace be won! And sharing all the “Commonwealth” is wise! It’s everybody’s earth! And it’s everybody’s sun! To wake to in the morning when we rise! While puppets on their strings do violent things!